With most of the city feeling so new, it can be sometimes hard to imagine Chandler with an extensive history. Enter the East Valley History Center & Research Archives at the McCullough-Price House, which is part of the Chandler Museum campus. Exploring Chandler’s historical photos and texts has never been easier. The McCullough-Price House was originally built in 1938 and is listed on the National Register of Historic Places. The 3,300 square foot Pueblo Revival style home mixes the original beams and other features with mid century modern furniture. The archive contains old newspapers (including the Chandler Arizonan), photographs, yearbooks, maps, and photos from the early 1900s to the present day captured on microfilm. The House also features tiny exhibits and the offices for the museum staff. Just to the north of the McCullough-Price house is the brand new 10,000 square foot Chandler Museum. Built to complement the historic house, the modern building is the centerpiece of the new museum campus. It showcases a sculpture by artist Jeff Zischke, Infinite Shade, which serves as the shade structure for the outdoor courtyard during the day but is beautifully lit during the evening. 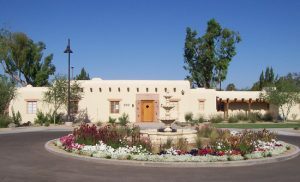 The Chandler Museum features both local and travelling national shows and exhibits. Regular hours for the Chandler Museum are Tuesday through Saturday, 10am to 5pm and Sunday, 1-5pm. Admission is free. 300 S. Chandler Village Drive Chandler, AZ. Find out more at www.chandlermuseum.org. If you’re considering making this great city your home, please give us a call at 480-355-8645 or email at info@locatearizonahomes.com today! We’d be happy to share more area tidbits and things to do customized to your lifestyle. Previous Previous post: Welcome to 5521 E Holmes Ave Mesa – Just Listed!